Mycophenolate mofetil is indicated for the prophylaxis of solid organ rejection in adults receiving allogeneic organ transplants.,Mycophenolate mofetil is indicated for the prophylaxis of organ rejection in paediatric patients (2 to 18 years) receiving allogeneic renal transplants. 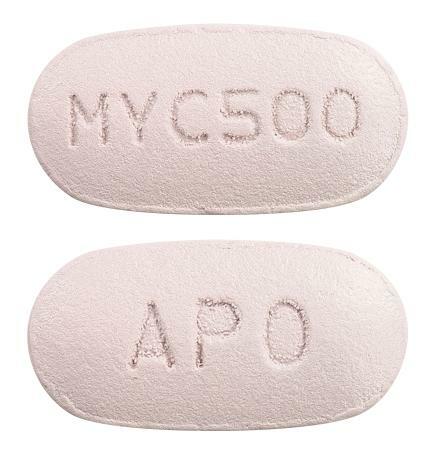 Lavender, film-coated, capsule shaped tablets engraved "APO" on one side and "MYC500" on the other side. Opaque blue cap and opaque pink body in Size 1 capsule containing white to off white powder. 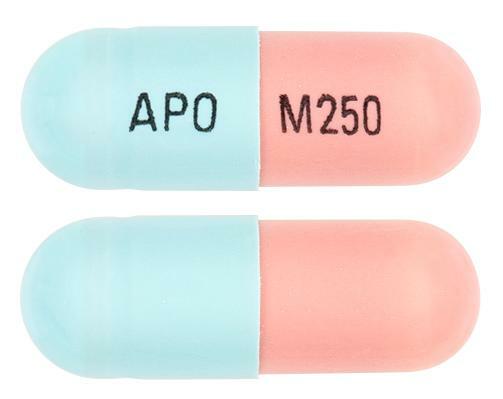 "M250" and "APO" are imprinted on capsules in black ink.